HQ IVR Menu (Interactive Voice Response) with up to 5 options professionally recorded with first-rate mics and voice processors, by your choice of talented voices. It's easier than ever to have personalized, professional voice recordings for your business now with our new quick and easy HQ voice recording Packages! - Step one: Write the text you want for your HQ Voice recordings. - Step two: Choose one of our 6 Professional Voices by using our click-to-preview table. "Welcome to Business A. For sales press 1. For support Press 2. For all other inquiries press 3." 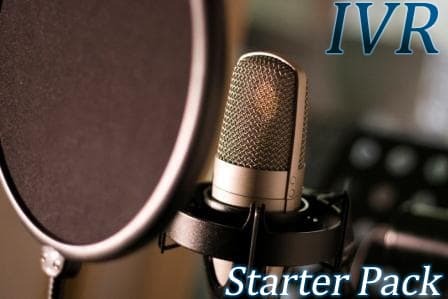 Have a question about the IVR Starter Pack Professional Voice Recording?